The Neon Necklace is a quick and easy way to visually identify which students have turned in a special assignment, say, a book report, and who stills needs that extra bit of prompting or intervention. First, I made a set of necklaces from neon-colored shoe laces I found at the dollar store. I took each lace and tied its ends together. I made about 30 of them and hung them on a hook attached to our whiteboard. Then, I introduced the new idea to my students. As you know, your book report is due today by 2:00. Please place your report in the folder, and mark off your number on the Check Off List. After you’ve done that, come see me. I’ve got a Neon Necklace for you. As students turn in their book reports, they come to me for a Neon Necklace. After receiving their necklaces, they put them on. Some kids wear them around their neck, as designed, while others will wear them around their wrists. Either is fine as long as the necklace is visible. Everyone benefits from the Neon Necklace. For my students, it becomes a badge of honor. (If you’re wearing a necklace it means you’re a member of Club Ed.) The necklace shows that the wearer has completed and handed in his book report. And since most students are status junkies, they work hard to be able to wear one. The benefit for me is obvious: I no longer have to guess which students aren’t finished yet. Imagine it’s time for recess. If you’re in the Club, the boat is sailin’. I then pause as the students who have already turned in their book reports were dismissed to recess. I’d also be beaming at them in recognition of their hard work and effort. 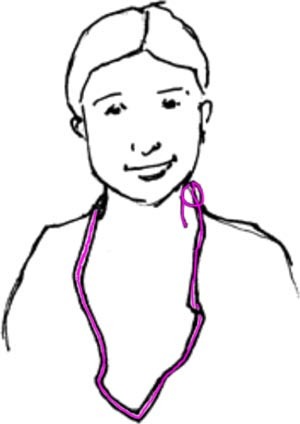 Suggestion: In the interests of physical safety, students are asked to remove their necklaces from around their necks and wrap it around their wrists before they leave for recess. That’s just a suggestion. See you later. Enjoy your recess. Let’s move the clock forward to 11:30. During the next ten minutes, before my students head to lunch, they are given E.T., or extra time. Their first responsibility is to complete any unfinished assignments. After that, it’s up to them. They can read, draw, use the computers, or play a simple game with a friend. During E.T. I notice four girls using the computers. Of the four, three are wearing a necklace and one isn’t. Hmmmmmm. Looks like it’s time to intervene. Ah, I see you’re playing “Where in world is Carmen Sandiego.” Good choice, girls. I surreptitiously motion Rebecca away from the computer for a private talk. Rebecca, I see you’re not wearing a necklace. Have you taken it off or is your report not yet finished? Well, let’s go back to your desk and see what you have so far. At the end of the day, all of the necklaces are collected and hung on the hook until needed again. Problem: Please be aware that there are now many districts that expressly forbid giving anything to students to be worn around the neck. Although this is merely a reflection of our increasingly litigious society, this mandate would prevent the use of the Neon Necklace strategy. Bummer. Solution: If that’s the case, you might want to try what I’ve been doing lately. I’ve been using scrunchies. I found them at the dollar store, six for a buck. I bought a class set along with a little plastic tub in which to keep them. The beauty of the scrunchy is that you don’t have to worry about anyone being gagged accidentally but they’re still highly visible on a student’s wrist. 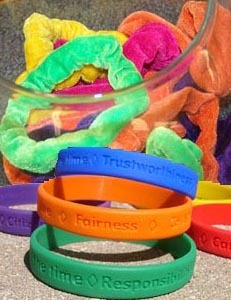 You could also use the kind of rubber bracelet popularized by the Lance Armstrong foundation and now being sold by the friendly folks from Character Counts. (charactercounts.org) You can get a pack of 30 for a reasonable price.